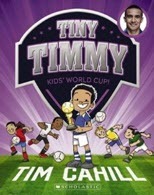 I love football and in this book Tiny Timmy and his friends play a gala day football tournament. It was quite easy to read and has lots of cool pictures. I loved this book. This book is really interesting.It has lots of true facts about football.The other thing I liked was that it also has photographs. Everyone’s talking about it – tonight the All Whites play Mexico at Westpac Stadium in the World Cup qualifier playoffs.